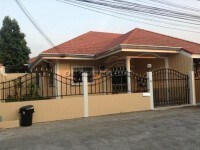 Eakmongkol4 This village is located in in Soi Khao Talo, a popular location ,very convenient for getting into Pattaya City quickly or out to further destinations via Sukhumvit Road. Close to a variety of shops, international restaurants,supermarket , local markets with street food,and schools. This house available for 1 year contract ,no pets.